Earlier this year I found two perfect pieces to complete my foyer and make it a cozy colorful first impression for my guests. These two pieces were old and weathered but still had life in them, they just needed some TLC and a little paint. 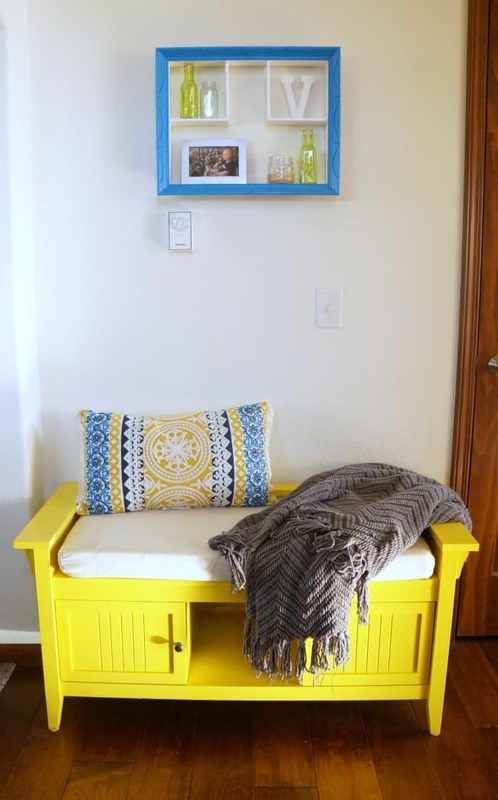 I updated this wall curio first, and last week I finished a dated laminate bench to complete my cozy colorful foyer. This bench was handed down to me when when bought our first house in 2008. It has been in multiple rooms in both homes and I like it’s functionality. However, the drab brown chipped laminate was not working for me anymore. 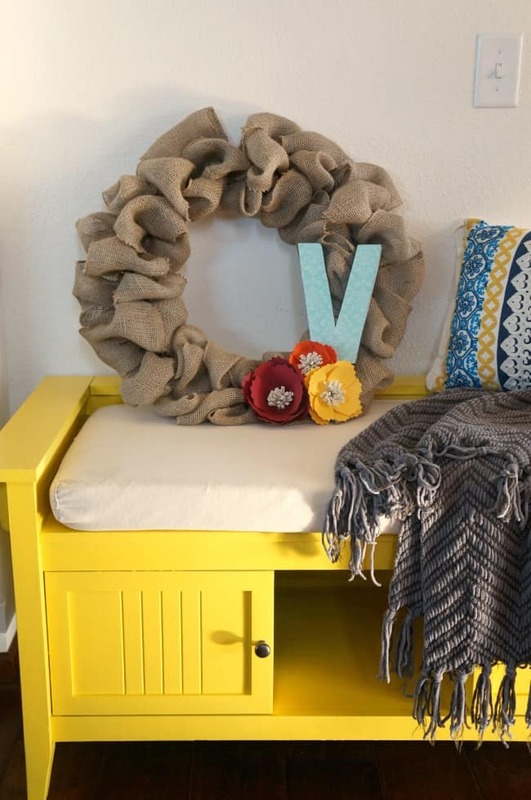 I chose to paint it a cheery yellow to create a colorful foyer. YES you can paint laminate furniture! Before painting any furniture, be sure to clean or dust it and remove any rough edges. Next, the most important step, prime your laminate piece with an oil based stain blocking primer. This will allow paint to stick to it. I always use Zinsser stain blocking primer. Without a primer, paint will not adhere properly to laminate. After it was fully coated in primer and dry I used my favorite birthday present, this Wagner Home Decor paint sprayer, to paint 2 coats of cheery yellow. Using a paint sprayer I didn’t have to worry about brush marks or drips. I set the sprayer to use just the right amount of paint for a flawless finish. I like this particular paint sprayer because the motor is on the ground. I handheld piece just hold the paint and lightweight nozzel. This is great for projects that take a little time and require various angles. 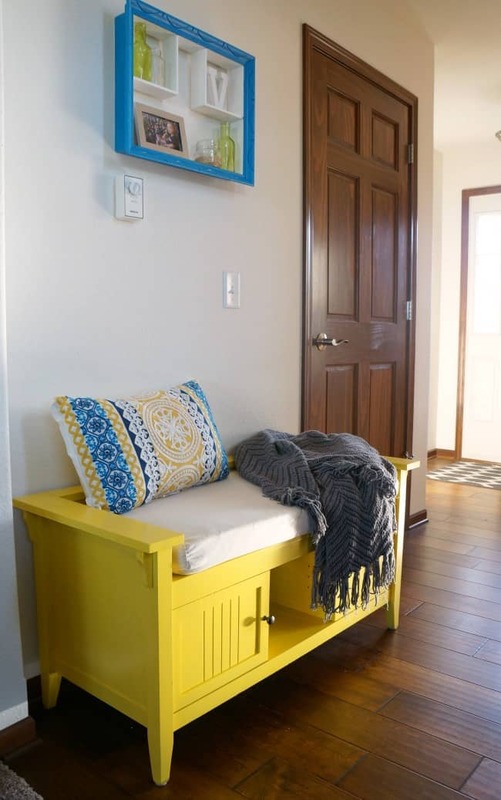 Now that the bench is done I feel like my foyer is complete…almost. I still want to add some fun new lighting, but for now the color that this bench and wall curio bring to my foyer is beautiful. 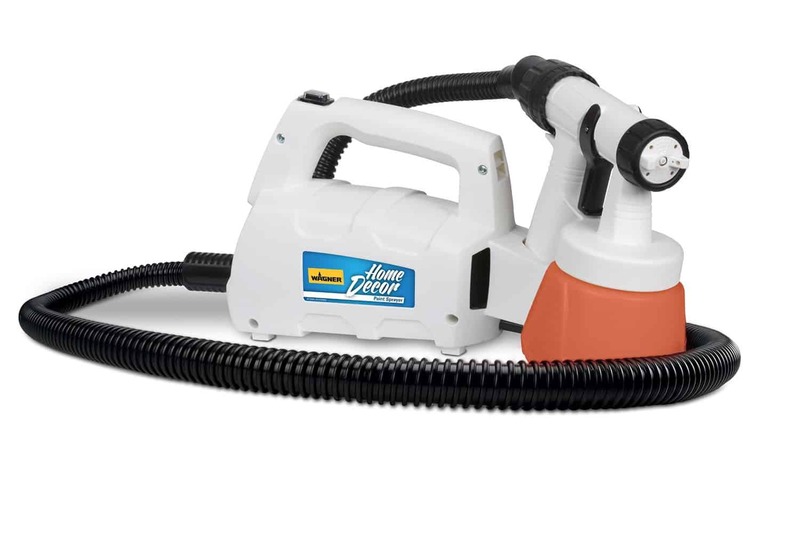 If you had a paint sprayer, what would you paint first? I know this is an older post, but I fell in love with your yellow bench. I’ve never spray painted furniture yet and other blog friends tell me how handy spraying is and how well it turns out. Yours looks perfect. Thank you so much Sue. The right sprayer makes all the difference. Oh my gosh, how I love color! You paired everything together so beautifully! What an inspiration! 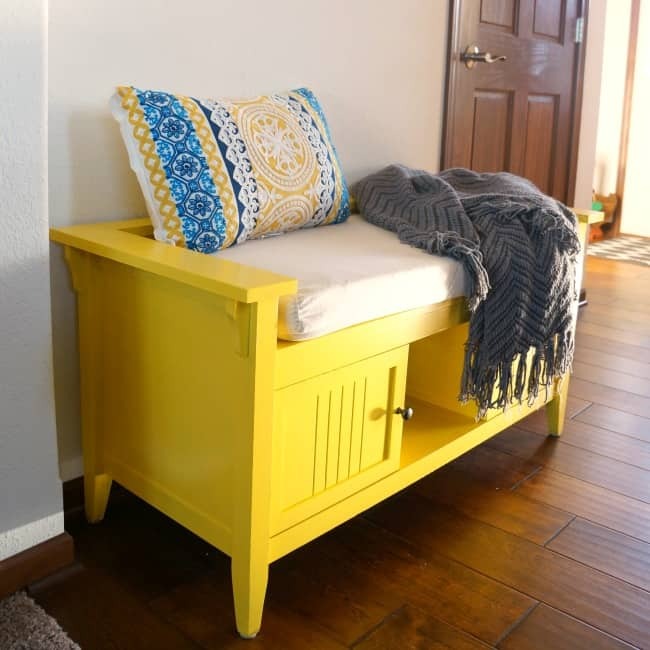 Hey Sarah, that little bench is so perfect…I completely understand why you’ve used it in so many rooms. It’s so very versatile. And yellow is one of my all time favorite colors. I just recently started using a paint sprayer and it is a game changer! Gorgeous colour that you went with your bench! Such a bright and welcoming foyer!